Skullflower's last full-length album on Cold Spring Fucked On A Pile of Corpses represented a full-on return to uncompromising noise but Draconis, spread over two discs with large scale packaging, is something altogether different from the duo of Mathew Bower and Samantha Davies. Sure noise plays a role here but the black droning guitars create a deeply immersive and transcendent sound, ornamented with touches of violin and synthesizer. Wrapped in a blanket of sound Skullflower are channelling memories tapping into the distant past. On Draconis that past is found in the Yorkshire dales, which, together with Khem and the Himalayan lands of the Bhutan, Bower calls the Dragon Lands. 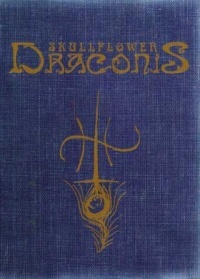 Draconis, like previous Skullfower releases, is steeped in Bower's love of arcane mythology and esoteric spirituality. I can't say I can decipher Bower's workings but on Draconis elements of Kenneth Grant's Typhonian writings, Crowley's astrology, sit alongside kali worship, making Draconis by far the most occult release from Skullflower. Draconis is aeons apart from the squalling noise rock riffage and improvisations of the earlier influential formations of Skullflower, whose avant noise excursions played a pivotal role in the late eighties and early nineties noise rock scene. Skullflower under the leadership of Matthew Bower is an altogether different beast. Bookended with titles alluding to astrological references to dragons, the first disc of Draconis ascends from the tail (Cauda Draconis) to the dragon's head (Caput Draconis). Bursting forth with waves of scorching guitar frequencies Draconis opens with 'Cauda Draconis' with flailing bass movements lurking below the surface before cutting abruptly to a brief passage of black metal movements. Even though recent Skullfower releases have toyed with black metal riffage these fragments are the only evidence of it here. A blurred mantra of churning drone and mixed down bells is found on the stunning 'Dazed Nymph In The N.O.X.' evoking a night with Pan. And yet it is the indistinct melodies and distant chants that surface amidst the dizzying miasma of sound that make this so satisfying. It is these invisible presences and audible hallucinations that Skullflower make manifest that makes Draconis so alluring. Chants, bagpipes, orchestrations, melodies, harmonies all seem to materialize in mellifluous form before dissipating back into the background. Maybe they were never there at all. With blustering drone and flutters of skittering rhythm 'Dark Daze' is perhaps less complex and intense but it is on 'To Raise Wolves' where Skullflower scale new heights. Here soaring guitars weave around bursts of noise, the whole thing laced with a siren overload. It's like nothing you've ever heard from Skullflower before. Just as staggering is 'Nightblooms For The Witch Queen'; its ferocious, churning, modulations drenched in plumes of stuttering static, like a ghost radio station soundtracking a ritual. The first disc ends on the black psychedelia of 'Caput Draconis', referencing the dragon's head, with wayward synths and frequencies, detuned orchestral musings, catching moments of ominous shudders underneath. The second disc lurches from 'Alien Awakening', a brutal windswept howling of distorted wah guitars, like a careering Chrome fed backwards through a mincer, to the blistering guitar onslaught of 'Autumns Trinkets' where a mass of woozy revving drones cloud a wailing agonised cry. The noise is diluted somewhat on 'Sunset Dreams' creating a blissful transcendent hum of ambient guitars and rattling percussion. That feeling of ambience is combined with black psychedelia on 'Dresden Spires' where the hum of guitars clashes with churning drones and mammoth thunderous crashes. It's the yin to the yang of 'Sunset Dreams'. Skullflower move into new realms on the extended final track 'Dakshinikalika'. Cast against a wall of hiss, it evolves slowly from grating violin and a howl which sounds sucked from the fiery pits of hell. It gradually changes form to the point that it sounds like a ritual infused piece beamed in from the ether merging primal screams with phantom overtures. It is a fittingly hauntingly bleak melancholic coda to the whirlwind and transcendent tracks that precede it.